Summary. This pictogram is another ETC appeal to people of Earth. 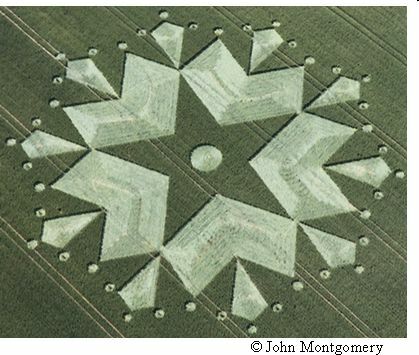 This is indicated by close arrangement of the crop circle near houses. ETC address to earth dwellers with a report that it is necessary to make the Transition to another level of the material world in the following cycle of life through the civilization’ united consciousness. It is the only way to escape from global cataclysms which will soon begin due to critical weakening of magnetic field of our planet. In the center of the crop circle an individual cell with a small area of the brain is shown (Fig. 1, a small circle in the center). This is a presentation of a human being at the Information level of the Universe (Fig. 2). The consciousness of the human being corresponds to the fourth level of consciousness. The five-pointed star represents the fifth level of consciousness. This level corresponds to mankind association of consciousness (fig. 3, fig. 4). The united consciousness cell has expanded area of brain which covers the star beams (fig. 3 red circle in the centre). ETC urge mankind to unite consciousness because it causes action. This action of the united consciousness will transform our body, and we will make the Transition to other level of the material world where cataclysms will not happen. Action arises in the united cell as a result of information rearrangements according to the set goal. Thus, ETC have represented a uniform information cell of mankind in beams of a five-pointed star. Between two beams of a star the hexagonal shape figure is shown (fig. 5). Actually it consists of two connected diamond-quadrangles (Fig. 6). The arrow-quadrangle points on a line of their connection (fig. 7). Quadrangles designate the fourth level of consciousness of the human being. They are two because they represent the principle of the united consciousness: two individual cells with a small area of the brain form one united cell with an expanded area of the brain. These hexagonal shapes figures are connected among themselves (Fig. 11). Quadrangular arrows specify at the junction points. Quadrangular arrows indicate on either the connection of two figures (fig. 11, yellow arrows), or at the point of their contact (fig. 11, a red arrow). So association of mankind consciousness is shown. This principle represents also a quadrangular arrow with small circles, like points surrounding its one end (fig. 7). One should note that in some circles the middle is noted (Fig. 8, yellow arrows), while in others is not pointed, they are smooth (Fig. 8, blue arrows). Usually this figure EC sought a special reception. In the circles with the center, they leave a tuft of grass in the center of the circle (Fig. 9), and in smooth circles of the beam is not (Fig. 10). Usually ETC achieve this kind of drawing by special method. In circles with the centre ETC leave a bunch of grass in the circle centre (fig. 9), and in smooth circles such bunches are absent (fig. 10). A small circle with a bunch in the center represents an individual cell with a small area of brain (Fig. 9). A smooth circle shows simply an expanded brain area of the united cell (Fig. 10). Thus, the small circles surrounding the drawing represent the symbol of individual cells and the expanded brain areas of the united cells. 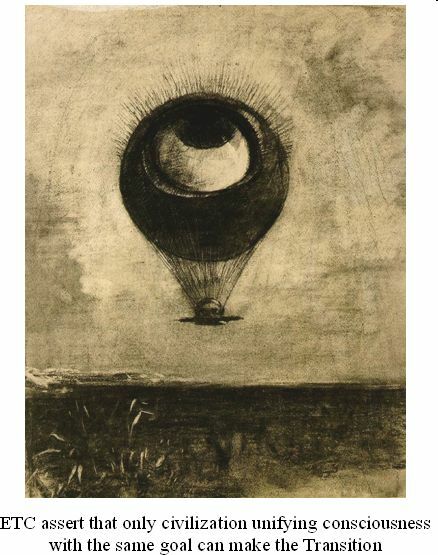 These images alternate (fig. 11). 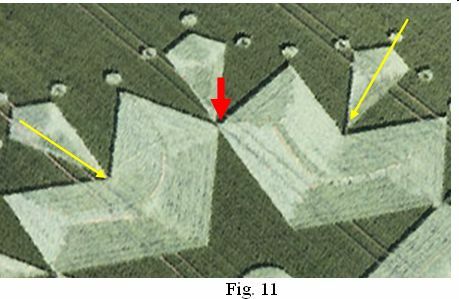 Pictograms with a pentagonal star have been presented in crop circles earlier. And always in the centre is shown the individual cell of human being. This way ETC warn mankind that the individual consciousness must be changed to civilization united consciousness as soon as possible. 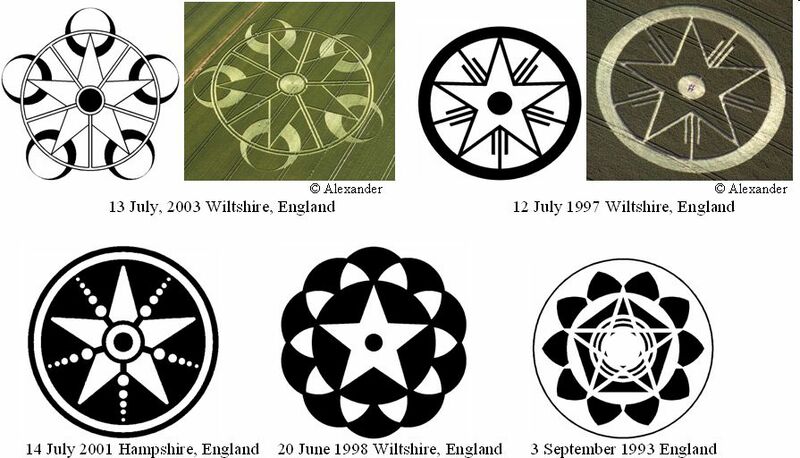 The difference between the pictogram on July, 3rd, 2010 and other pictograms with five-pointed stars is that for the first time this kind of crop circle is composed of three-dimensional elements. Three-dimensional image in ETC pictographs means extreme danger. 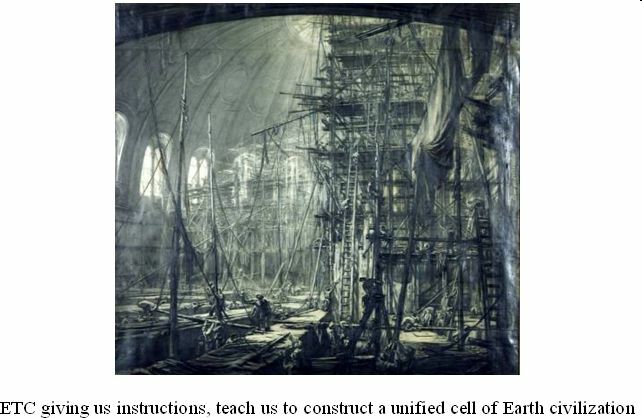 The 3-D star specifies on necessity of immediate association of civilization consciousness. These are ETC instructions on promptness and urgency of mankind actions.